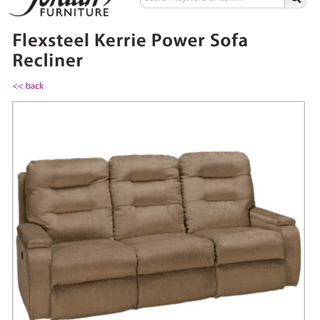 Boasting fashionable looks and expert craftsmanship, the Kerrie Power Sofa Recliner truly transforms your living room. It offers plush seating comfort with its cushioned seats, tufted backs, and padded armrests and footrests. This traditional-style recliner sofa promises a relaxing lounging experience with its seamless power mechanism and soft fabric upholstery. Custom-order fabrics are available. This is couch is very comfortable whether you’re stretched out or reclining. Also, the motor to recline is very, very quiet and I really love the two ports on each end to charge your phone and or iPad. Although it was broken when it arrived, Jordan's came back the following day, and was able to repair the issue. When product arrived the left side of the recliner automatically reclined and stayed that way. Had to wait for tech to come out to fix the problem. Problem was fixed needed new switch. For 2 days ran good then would not recline at all. Called in they asked me to flip the couch to see if it was plugged in. Mind you now this is a new couch and the tech had left the day before. I did check but did not where to look tech came back and sure enough the plug had come apart. We have owned the couch for 3 months and already it has started to lose it shape on the recliner end fabric is stretching and couch looks like it is sagging. Will call customer service once again to see if anything can be done. Very comfortable even when you lie down across recliners. Very happy so we'll work around the dusting under it. We just received this sofa today - the left side recliner does not work - I should have had the delivery people check the reclining function before they left -- I didn't. I am wondering if there are two things that need to be plugged in as the cord that plugs in the wall does have an outlet on it. I don't think the delivery people were that familiar with the product. If there is something else that needs to be plugged in please let me know and we will take care of it if you provide instructions. A team member from the Jordan's Furniture Customer Service department will contact you regarding your new power sofa recliner.